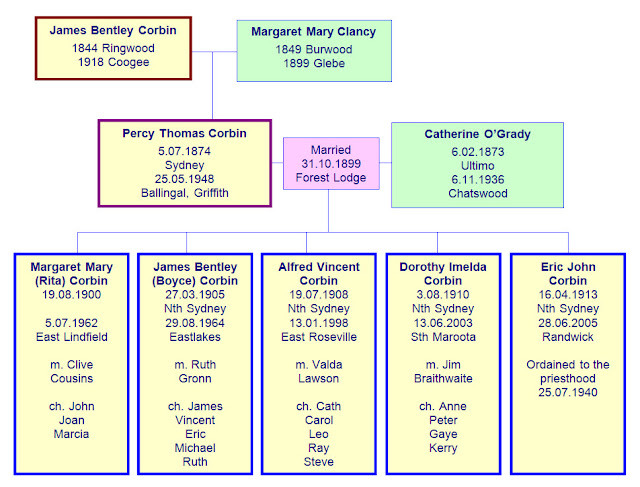 Percy Thomas Corbin, fourth child of James & Margaret, was born on 5 July 1874 when the family was living in Castlereagh St Sydney. As a single man he became involved with a city club called the Athenaeum Club, where he was secretary and seems to have lived for a time. In 1899 he married Catherine O'Grady at Forest Lodge. They eventually got themselves settled at 'Loretto', King St North Sydney (now Waverton). The house still exists. All of the kids except the eldest, Rita, were born there. Percy took a while to settle into a career in his early years. He worked with his father at his Hunter St building business for a time. In 1914, just after the youngest child Eric was born, he got a job with the Water Conservation & Irrigation Commission, starting as 'Ledgerkeeper, Leeton'. This was the early days of irrigation in the NSW Riverina. 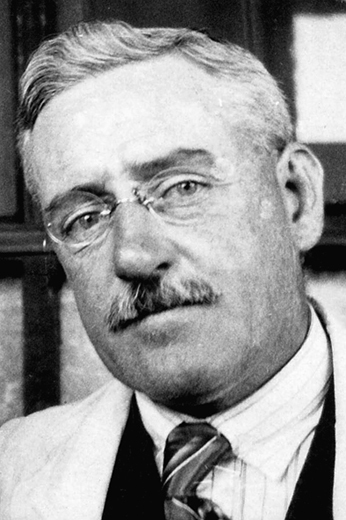 He moved the family to Leeton, and later to nearby Griffith in 1921, and the five kids all grew up in the district. He was choirmaster at the Catholic church. Percy took a promotion from Griffith back to Leeton in 1925, then got a position in head office in Sydney in October 1928. The family moved to Chatswood, living at 331 Mowbray Rd for a time. The elder ones Rita and Jim (Boyce) had left home by then, and Eric went into the seminary to study for the priesthood. In 1936, when they were living at 16 Violet St Chatswood, Catherine died, aged 63. As Percy moved into retirement age he lived with some of his O'Grady in-laws at Lakemba, where they had moved from Glebe. Then he went back to the Riverina and spent his final years living with his daughter Dorothy and family on husband Jim Braithwaite's farm at Griffith. Percy died at the farm at Ballingal, Griffith on 25 May 1948, aged 73. He is buried with his wife in Northern Suburbs Cemetery. While he was on the farm at Griffith, one of Dorothy's children, Anne (photo at right), contracted polio and had to be sent to Sydney for treatment. Percy temporarily moved back to Lakemba so he could visit his little granddaughter every day in hospital, an act of kindness which Anne will never forget. His son Jim (the second James Bentley Corbin, but always known to his siblings as Boyce), who was an Eastlakes chemist, received an MBE for services to amateur radio and for his role in maintaining communications during the NSW floods of 1955. Currently there are 120 living descendants of Percy & Catherine.